The 2015 to 2016 screening year – 1 April 2015 to 31 March 2016 – was particularly exciting and productive for the UK National Screening Committee (UK NSC). 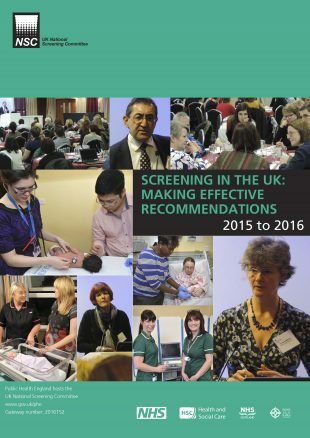 This week we published our annual evidence report Screening in the UK: making effective recommendations 2015 to 2016. It summarises the recommendations we made during the year and the evidence behind those recommendations. The report also enables us to welcome incoming UK NSC Chair Professor Bob Steele and say farewell to outgoing chair Professor David Walker. I’d thoroughly recommend giving it a read. It puts all the work we do into context and emphasises the importance of robust evidence for any population-based screening programme. I’d like to take this opportunity to thank David, the secretariat, stakeholders and academics for all their hard work and support. Without them, we wouldn’t have been able to complete this astonishing amount of high quality work. And there is no let-up in any of that work. This September we will be piloting our first annual call for topics to review. And we’re already starting to plan for the UK NSC’s second annual stakeholder conference in December.